Banks have long favored direct mail marketing as a means of raising their profiles, showcasing their offerings and cross-selling other financial products. 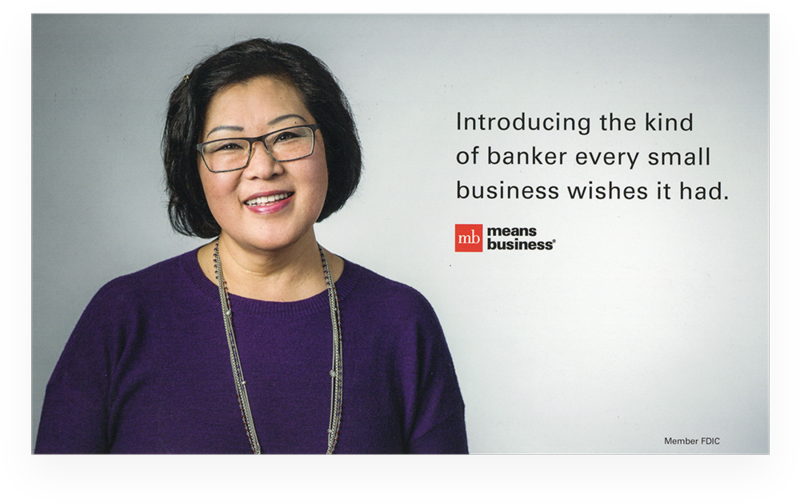 For MB Financial, direct mail anchored its new outreach to the Chicago area’s small businesses as an ideal way to use digital printing, targeted databases and one-to-one, people-oriented messaging. Its “MB Is Me” campaign significantly increased awareness and perceived brand differentiation, produced thousands of new business account leads, and boosted bank deposits. For more than 100 years, MB Financial Bank has built and supported deep financial relationships with individuals and middle-market companies in the Chicagoland area. As a regional, community bank, its motto has long been “MB Means Business,” underscoring its focus on serving the financial needs of local companies that have revenue from $10 million to $250 million annually. From checking and savings accounts, to such staples as business credit cards, payroll, financing and loans, and cash management, MB Financial has carved out a niche in Chicago and the surrounding communities as the go-to financial services source for middle-market companies. But the Chicago banking environment is intensely competitive. There are some 270 financial institutions in the market, and many of them focus on this very same middle-tier business segment. MB Financial saw both the need and the opportunity in looking elsewhere for business and deposits — specifically the small business market, those companies with yearly revenue under $10 million. Tellingly, there are an estimated 430,000 small businesses in the Chicago area, compared with fewer than 10,000 companies in the middle market, so the numbers alone were compelling. The company had committed itself to highlighting its small business advisors within each of its 86 branches to address community needs, and instituted a “white glove” concierge-type service to this small-business market — a service that usually is offered only by the biggest banks to the biggest companies. Moreover, MB developed a new marketing campaign targeting this small-business market. It was designed to be precise, personal, to rise above the competition and to help MB become the bank of choice for the area’s fledgling entrepreneurs. The “MB Is Me” campaign was born. For any company, wanting to achieve a strategic goal, and actually doing so, can be two different things. While MB Financial had been an enduring presence in its market for over a century, it wasn’t particularly known as the small-business bank — in fact, research showed it was viewed as too big for smaller businesses. But the under-$10 million commercial market offered undeniable opportunities for new accounts and deposits. Besides their sheer numbers, smaller businesses tend to decide quickly on a new banking partner and shift funds just as fast. Mid-sized companies, by contrast, take longer to convert, with deposits coming on board much further down the road, says Dan Butterworth, AVP of consumer marketing at MB Financial. Statistics showed that MB Financial’s long-serving staff, combined with a commitment to high-quality customer service, would pay off for the bank. 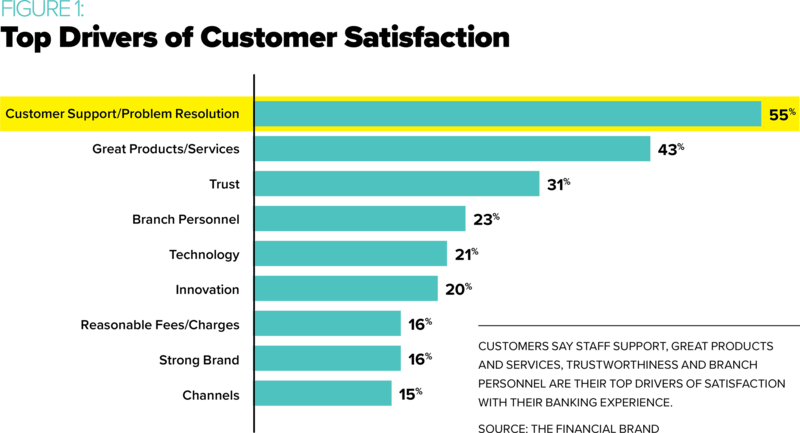 According to research from The Financial Brand, the top drivers of satisfaction among banking customers are: first, customer support and problem solving; followed by great products and services; trust; and branch personnel. MB Financial planned to leverage all of these attributes in its small business campaign. MB Financial also was aware of the entrepreneur’s need for financial advice. A report titled “Winning the Battle for Small-Business Customers” by Aite Group indicates that more than three-quarters of small businesses manage their own finances without the help of an internal financial controller or accountant, and thus struggle to create such essential tools as financial statements and cash flow forecasts. These businesses also are far more likely to use such tools as Microsoft Excel, Quicken or QuickBooks in managing their finances vs. the greater effectiveness available from bank money management tools and advisors. In short, small businesses often lack access to the advice that could help them identify risk and achieve success. MB Financial planned to address that need. the business connections you wouldn’t expect. 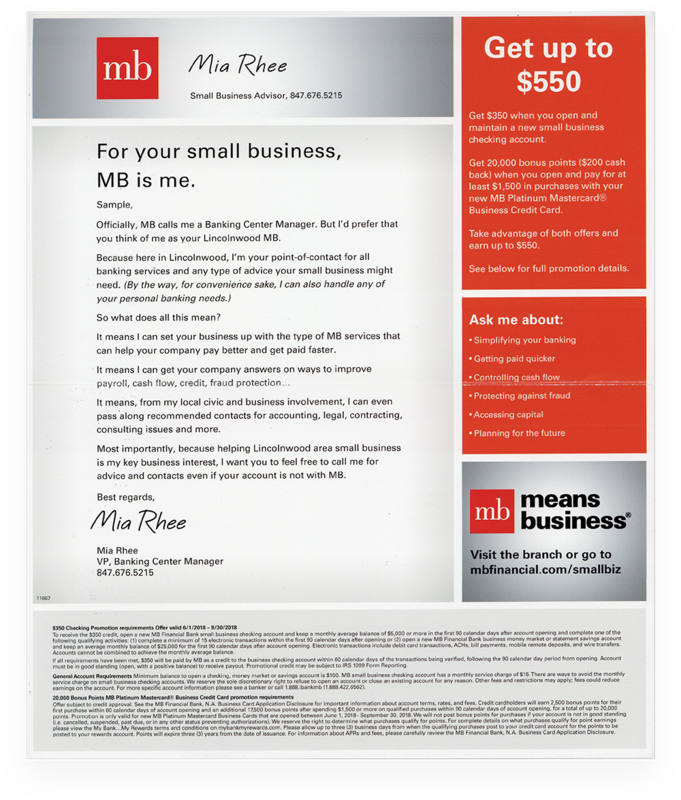 The “MB Is Me” small-business campaign used a variety of marketing channels, including print ads featuring small business owners, radio commercials, billboards and online videos. But direct mail was the heart of the campaign and its main lead generator, with digital printing, bar coding and sorting making each individual response traceable by branch managers. Recipients who responded to any of the mailings were removed from subsequent mailings, and entered a nurture stream. He points to potent evidence of direct mail’s abiding value. According to the U.S. Postal Service, some 77 percent of mail recipients sort through their mail as soon as it’s delivered. 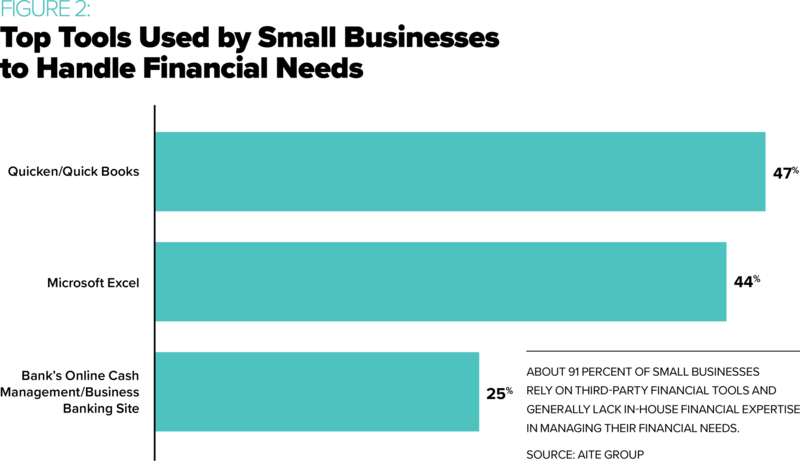 In addition, the USPS has found that direct mail recipients average 25 minutes reading their mail, compared with two seconds reading each email. And because direct mail has a strong record in cross-selling bank services, it’s no wonder that financial services companies have long been devoted to the channel, according to statistics compiled by the Data & Marketing Association. There was one additional dynamic that prompted MB Financial to select direct mail as a key element in the launch of its small business initiative: Avoiding clutter. These days, everyone suffers from an avalanche of digital offers they don’t want, and they’re frustrated with flooded email inboxes. Direct mail represents the uncluttered option. Any brand-new marketing campaign can expect a few challenges, but MB Financial’s small-business initiative was subject to a simple logistical one: Because the campaign was intensely community-based, with each branch singled out as the go-to resource for neighborhood businesses, the bank decided to make each of its branch managers the voice and face of the program in their particular neighborhoods. That meant coordinating professional photo shoots with all 86, to be featured in a personalized blizzard of direct mail to each one’s nearby small-business owners. Eventually every branch manager’s photo was taken in support of this critical marketing decision. Personalized letters also prominently featured the local branch manager’s invitation to small-business owners to become MB Financial customers. The “MB Is Me” campaign began in June 2018 and ran through the end of the year. MB Financial and its agency developed two customizable direct mail assets: a personalized postcard and a letter inside a personalized envelope. The contents of both were designed as coming specifically from each bank manager, and specifically to each recipient. The oversized postcards — 6 inches x 11 inches, folded in half — featured local branch managers, introduced as “the kind of banker every small business wishes it had.” The postcards were filled with personal references that only digital inkjet printing can provide: “Officially, MB calls me a Banking Center Manager. But I’d prefer that you think of me as your South Chicago MB,” went one postcard mailing. Other postcards referred to “your Lake Zurich MB,” “your Bucktown MB,” “your Calumet City MB,” or “your Vernon Hills MB.” Each was signed by the local banking center manager. Each was signed by the local banking center manager, and overall the postcards were mailed to a total of 30,000 businesses around MB Financial’s 86 banking centers. 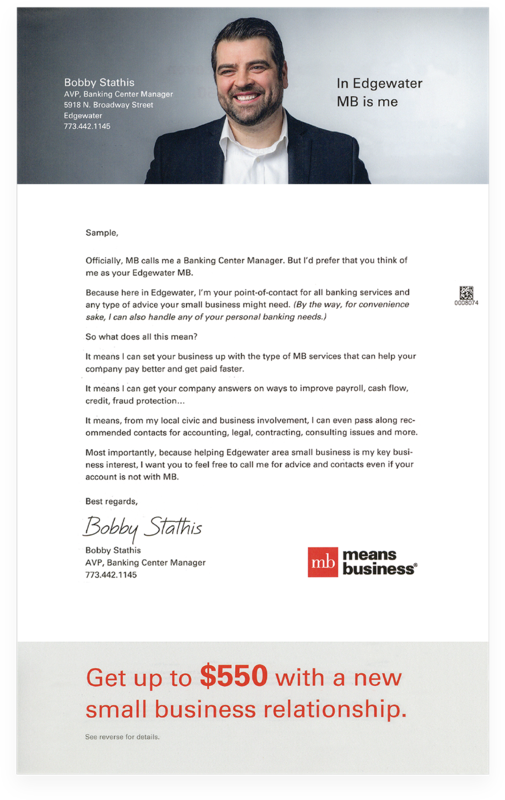 Alternating with the postcard every other month was a personalized letter containing similarly individualized salutations from MB banking center managers: “In Schaumburg, MB is me,” says Marcin Bos, banking center manager from the Schaumburg branch. As with the postcards, financial incentives were offered to inspire new small business relationships, but the essential elements of personalization — compelling messaging, and the full-service advisory offering — were the clear value propositions. Postcard messages featured personalized salutations, references to the recipient’s specific neighborhood and financial incentives. Midway through the campaign, interim results showed a 205 percent increase in leads, compared with the same period a year earlier. A strong response rate, attributable to the direct mail campaign, produced more meaningful conversations with Chicagoland small business-owners, and generated increased deposit dollars.